Mundorf is regarded as specialist in high-end components. We have, therefore, listed the most interesting ones below. 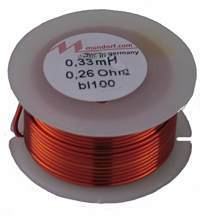 All listed coils are made of copper lacquer wire with a purity of > 99.995%. The coil body is made of glass fibre reinforced polyamide. The wire ends are tinned and labelled. Inductance is measured at 25 degrees Celsius; tolerance is +/- 3%. L denotes inductance, R the DC resistance, D the diameter, Le the length, W the width, H the height. Air coils (i.e. coils without a ferro-magnetic core) are absolutely distortion-free, which on the face of it makes them ideal for all audio applications. The trouble is, their electrical resistance increases with their inductance. There are two solutions to this problem: One can either use very thick windings (this is why our standard range includes windings with wire up to 3mm in diameter) or coils with cores. 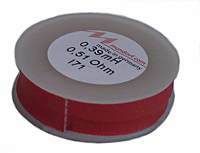 Lower cost and smaller size are also common reasons for choosing cored coils. beside baked varnish air coils we offer vacuum impregnated coils.